What a week I had in Orlando at the SAPInsider SCM/PLM Conference. The weather was cooler than normal but the energy inside the show was turned up. I was pleased to see a variety of topics in the session agenda offering real solutions for improving SAP® processes and new ideas for the future of Supply Chain. One of those sessions, led by a Winshuttle customer from Louisiana Pacific (LP), a building materials manufacturer, demonstrated how they’ve streamlined and digitized their product management processes. With the help of Winshuttle’s ROI calculator, LP was able to project real value, and gained approval to move forward with the Winshuttle platform. 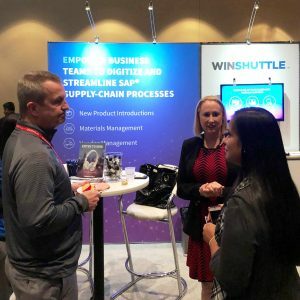 It was also really exciting to see the number of people who come by the Winshuttle booth after Lisa’s presentation to learn more about what LP did and how they did it. If you’re also ready to learn more, check out how Winshuttle can help improve your product launch processes and plant maintenance operations. Nichelle is Winshuttle Events Manager, handling all customer and marketing events for the company, primarily in North America. She is passionate about helping customers connect through events to share best practices and network. She also enjoys introducing Winshuttle software to people who have a need to make their SAP processes more efficient.